The basic pleasures of life in San Francisco are not just for locals: wonderful food, sparkling nightlife and those glorious views are there for everyone. Watch the white fog fill the Golden Gate as the sunset lights up the windows across the bay, and prepare to leave your heart right there. Its hilly streets provide some gorgeous glimpses of the sparkling bay and its famous bridges. San Francisco has an atmosphere of genteel chic mixed with offbeat innovation and a self-effacing quality so blatantly missing from brassy New York and plastic LA. Best way to explore San Francisco's neighbourhoods is on foot. A leisurely stroll through North Beach, with its relaxed European charm, leads smack into bustling Chinatown. A hike up hoity-toity Nob Hill segues down to the troubled Tenderloin. South of Market, a busy warehouse district during the day, transforms into nightclub central at night.The nearby Castro was claimed by gay men in the 1970s, and it remains predominantly gay today, projecting an assured, almost mainstream air. The Mission District is varied: many of its streets are Latino enclaves, but a continuous flow of hip young invaders has redefined many of the district’s crossroads. A young woman´s bone dating to about 3000 BC discovered when the Civic Center BART station was under construction in 1970 is the earliest evidence of human life to be uncovered in San Francisco, although the shell mounds left behind by people who subsisted on mussels and other seafood indicate the area was populated long before that. By 1000 BC the last native group to reside here, the Ohlone people, had constructed temporary villages in the marshlands near the bay shore and along inland creeks. They maintained this way of life until California fell under Spanish rule. The first European visitors to the San Francisco Bay Area missed the massive inlet altogether. 1579: Sir Francis Drake landed at Point Reyes, about 60km (35mi) north of San Francisco, claiming it for Queen Elizabeth and then sailing south straight past the Golden Gate. Not long after, Spanish explorers renamed the Point Reyes bay (now known as Drakes Bay) La Bahia de San Francisco, but then proceeded to wreck their ship on Point Reyes and had to crawl south to the safety of Acapulco in a vessel lashed together from the wreckage. They too failed to notice the San Francisco Bay. Its European discovery had to wait nearly 200 years more. 1775: Juan Manuel de Ayala became the first European to enter the Golden Gate. He was followed in 1776 by Captain Juan Bautista de Anza, who built a presidio (fort) above the Golden Gate and the Mission Dolores in the heart of today's Mission district. A tiny village known as Yerba Buena sprang up between the two and became the birthplace of modern San Francisco. In 1847, Yerba Buena was renamed San Francisco, just before a momentous discovery was made in the Sierra Nevada mountains to the east: there was gold in them thar hills. The news was soon out, and prospectors began to flood in; over 100,000 hardy '49ers (named after the year they made their voyage) endured the long overland trek or the dangerous sea voyage to San Francisco, and the city's population exploded from 500 to 25,000 within a year. 1850: From the days of the Gold Rush, San Francisco was always a freewheeling, hell-raising city - so much so that during the latter half of the 1800s, it became known as the Barbary Coast for its debauched resemblance to the pirate-plagued coast of North Africa. California became the 31st state in the union and by 1854 the booming Gold Rush town already had more than 500 saloons and 20 theatres to entertain the hard-spending miners. The initial Gold Rush fever had subsided by 1859, when a second rush took place, this time for the even richer wealth of the silver Comstock Lode near Reno, Nevada. 1870: The boom years of the gold and silver rushes dry up; nevertheless, the city grew steadily, and at the turn of the century the population was approaching 350,000. While the opening of numerous banks established its continuing importance as a financial centre, during the Spanish-American War in 1898 and the Klondike Gold Rush in Canada's Yukon in 1896 underlined the city's importance as a port. In 1812 and 1865, there had been major earthquakes in San Francisco, but the Big One of 18 April 1906 is estimated to have come in at around 8.3 on the Richter Scale (which had not, at that time, been invented), a magnitude still unmatched in California history. The real damage came from the fires - lit by toppling chimneys and fed by fractured gas mains - that swept across the city. By the time the conflagration had burned itself out, half the city was in ruins. It was not the quake itself that was to devastate San Francisco. A decade of frantic rebuilding followed the quake, and the 1915 Panama-Pacific International Exposition saw the city bigger and brighter than ever. San Francisco suffered through the Great Depression, despite enormous public works projects. Two of the most prominent, the Bay Bridge of 1936 and the Golden Gate Bridge of 1937, are still magnificent symbols of the area. In WWII, the Bay Area became a major launching pad for military operations in the Pacific, with gigantic shipyards springing up around the bay. 1950: The national attention was first focused on the city as the birthplace of a scene of its own. The Beat Generation was given a voiceWhen Jack Kerouac and Allen Ginsberg, upstart students at Columbia University, and Gregory Corso, 17 years old and fresh out of jail, fled the indifference of New York City and joined forces with a San Francisco poets' movement begun by poet and literary critic Kenneth Rexroth. Hub of the new Bohemia, Kerouac became their premier author, Ginsberg their poet, and cool jazz the sound of North Beach. In the 1960s hippies followed, and the Haight-Ashbury bloomed as the new hotspot. Local bands like the Grateful Dead and Jefferson Airplane set the tune for the movement, and when 20,000 people congregated in Golden Gate Park for a free concert in 1967, the 'Summer of Love' was born. Neighbouring Oakland was the scene for yet more revolution, as Eldridge Cleaver, Huey Newton and Bobby Seale headed the Black Panthers, the most militant group of the black power movement. While hippies in the Haight dropped acid and wore flowers in their hair, Berkeley revolutionaries were leading worldwide student upheavals, slugging it out with the cops and the university administration over civil rights. 1970: homosexual revolution followed, as San Francisco's gays stepped decisively out of the closet and slammed the door shut behind them. The 1977 election of gay activist Harvey Milk to the San Francisco Board of Supervisors brought recognition of the gay rights movement to a new peak, but the euphoria was to be short lived. Milk and Mayor George Moscone were assassinated by Dan Whiter, an avowedly anti-gay former police officer and supervisor, the following year. Their deaths and the emergence of the first cases of AIDS, at the time thought of as a 'gay cancer', marked the beginning of the end of the heyday. The rainbow banners and lavender triangles are as common today as they were 20 years ago, but the extravagance of the 1970s now resurfaces mainly at the Castro and Folsom St Fairs and the annual Gay & Lesbian Freedom Day parade. 1989: San Francisco's second 'Big One', the Loma Prieta earthquake, and measured 7.1 on the Richter scale. That year, baseball's World Series was a local affair between the San Francisco Giants and the Oakland A's. Sixty-seven people died in all, but the damage would have been far worse were it not for a baseball game. When the quake struck, the game was about to begin at San Francisco's Candlestick Park and a large chunk of the Bay Area population was at home watching it on TV, not out on the freeways stuck in rush-hour traffic. 1990: the Bay Area experienced another period of urban renewal with a building boom that spruced up neighbourhoods and historic buildings across the region, making it an increasingly expensive place to live. San Francisco's history has always been one of vital cultural waves and cold-hearted economic surges, booms and recessions, and the first decade of the new century is no different - the waves of change just keep on rolling in. 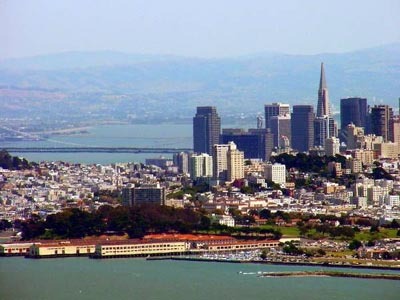 The New Media boom, launched in Silicon Valley but at its artistic cutting edge in San Francisco, lured technologically savvy entrepreneurs to the 'Citee by the Bay'. But the dot-com boom was destined to go bust, and shortly after the turn of the millennium the industry indeed took an awkward swan dive, although not before billions of dollars had changed hands.